The tower received its name from the revolutionary Cagliari Vincenzo Sulis who was imprisoned and spent 22 years inside the tower in isolation. It is one of the majestic towers with 6 meters thick walls, with three floors and high vaults supported by massive ribs. All these three floors are connected with an internal staircase that is in helical shape. The entrance you see today was added in the year 2007 after the actual entrance was demolished back in 1800. The previous entrance was built to connect the nearby two towers, St James and St John. The big guns kept on the side of the tower were recovered from a Spanish galleon that sunk in 1500, along the coast of Alghero. The interior is sometimes used as exhibition. How popular is Torre Di Sulis? People normally club together Torre Di San Giovanni Di Alghero and Sea Walls while planning their visit to Torre Di Sulis. Pretty much the symbol of Alghero. Very beautiful. Love these architectures. Beautiful place, the historic centre is very nice. The monument was closed when I visited. Cannot comment on the interior. From the onset very archaic. The walk along the sea nearby the monument is picturesque. 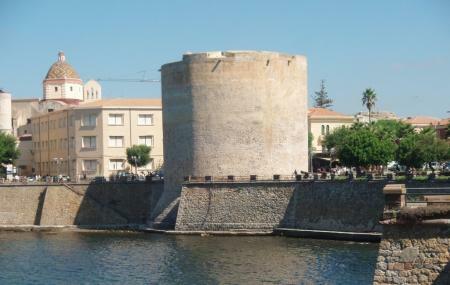 Located in Piazza Sulis is one of the imposing towers of the citadel of Alghero. To see, when you visit the historic center of Alghero.